Official Apology from the Commander of Pawlice! 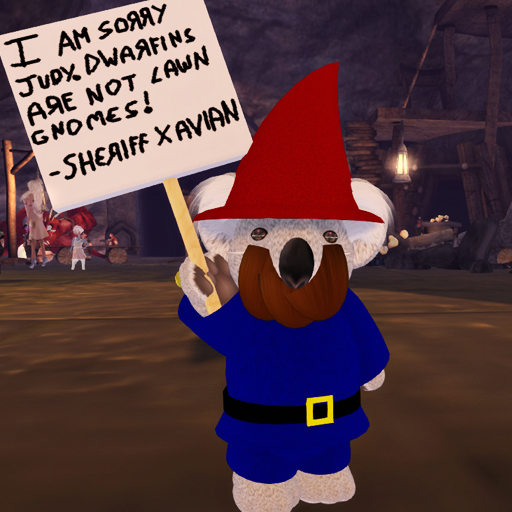 Xavian Starsider, the Commander of the Tiny Sheriffs Association, has had a lot to answer this Faire. There has been accusations of corruption, of the confiscated waffles ending in Pawlice mouths, of rampant delivery of injustice and even invented regulations, not to mention the new addition of the ferocious and clearly unstable dinkie cat officers into the Paw Force! Despite all the near-riots against the Pawlice, the Commander has never admitted having done anything wrong. Until yesterday. On Saturday, May 10th, a day that will go down in history, Xavian Starsider issued an official apology to Judy Chestnut of Dwarfins in Hope’s Horizon. There seems to have been some spark of regret in his tiny koala heart, for later on he was seen mumbling and grumbling “Sorry Judy.” and “Judy I’m sorry I called dwarfins lawn gnomes.” and even to crown the apology with his eloquence: “msrryjdy”. He may be one tough koala and he may throw you in jail for looking at waffles sideways, but at least we have had one official apology from the Tiny Sheriffs! Enjoy it for its rarity for we don’t know if we will see another. Ever. Previous PostDaily Recap: SaturdayNext PostMeet Our Sponsors: Fallen Gods Inc.